Just what goes into providing a successful waste management program at a conference? If you follow the example of the Unitarian Universalist Association a heck of a lot more than just showing up at the convention center and tossing your bottle in a recycling bin. In fact, UUA has been preparing for over three years to reduce event waste at their upcoming 2013 General Assembly in Louisville, Kentucky. The process begins with thoughtful purchasing to minimize use of disposable materials onsite. The weight of items discarded to recycling, compost and landfill at the event has dropped by 20% per person between 2011 and 2012, and further reductions are being targeted in 2013. In fact, with a little more than one pound per person recycled, composted and landfilled each day of the event, this is 80% less than other conferences. As the above excerpt from their 2012 sustainable event report shows, UUA also takes special effort to ensure diversion of discards from landfill. The first step in this process after reduction efforts is contracting with the venue to ensure delivery of a comprehensive waste management plan that goes beyond “business as usual”. To action the strategy the event team visits local recycling plants, recruits and trains volunteers, provides onsite education, audits to prevent contamination and verifies waste is disposed of properly. In this case, efforts led to a record-setting 87% diversion from landfill and 0.7 pounds of trash per person over the 5-day event. For more information on UUA’s sustainable event initiative check out their web site, or come to the 2013 event in Louisville! MeetGreen will be onsite to discuss any questions and receive feedback you have about the event waste program. 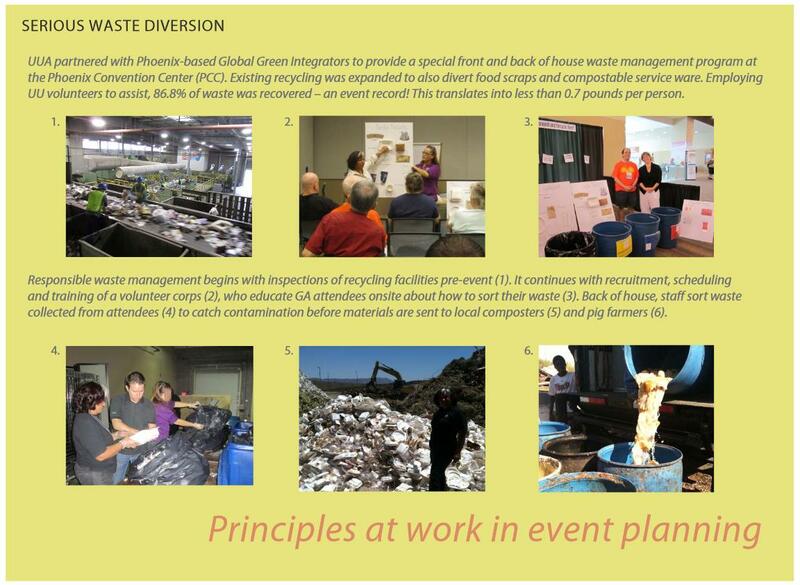 To assist with implementing a similar program for your event in Phoenix, the site of General Assembly 2012, I’d also encourage you to contact Global Green Integrators, a great zero-waste event partner!